An aerial view of traffic moving along Interstate 40 past the Producers Cooperative Oil Mill in downtown Oklahoma City. A large, vacant property in downtown Oklahoma City could be demolished as soon as this winter, paving the way for new development. The Producers Cooperative Oil Mill has filed paperwork to demolish the ten structures on the site. The co-op now operates in Altus. The Journal Record’s Molly Fleming writes the property is listed at $65 million dollars, and broker Don Hayes is marketing the property. He said Producers Co-Op would like to sell the property, but there may be ground lease opportunities available as well. The first step is to figure out how to best use the land, he said. Fleming said Hayes described the property as a jewel. Sooner Investment Realty is eyeing the property and working with Producer’s Co-op to figure out the best use for the land. Partner Bob Stearns says he hopes to reveal a plan in May. Sooner Investment is primarily known for retail developments, such as the Academy Sports and Hobby Lobby stores in Midwest City. Fleming says the development could be a mix of retail, multi-family and office buildings. 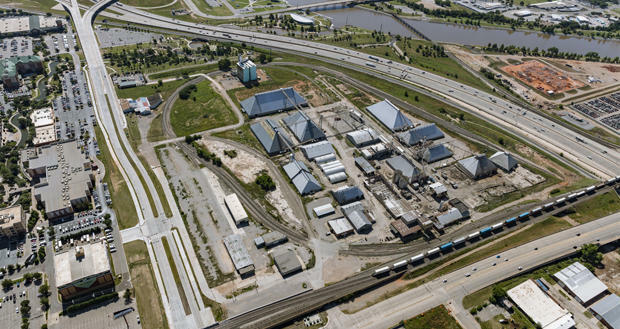 “Stearns said very sternly though that he doesn't want to make another Bricktown. He doesn't want to do another central business district. He wants to do something special at this site,” Fleming said. The property was previously under consideration for a soccer stadium. Oklahoma City Energy owner Bob Funk, Jr. was hoping for a public-private partnership to build the stadium. “The city isn't going forward with more MAPS work in the bond project list, which people will vote on in September. And that did not include money for the soccer stadium,” Fleming said. Fleming says Funk is now looking at developing a stadium in the Whealer District. The Energy’s league, the United States Soccer Federation, wants all of its teams to play in soccer-specific stadium by 2020. The Energy play in Taft Stadium, which Fleming says is three yards short of the Federation’s standards. Major League Soccer is planning to expand to four new cities. Funk did not apply for the Energy to join MLS during the current round of expansion, but Fleming says Funk has a nine-year plan to bring the league to Oklahoma City. “He thinks the MLS will add more teams by the time he wants to apply. But MLS has several things it looks for including two key items which are attendance and a good television market. The Energy brings about 4,400 people to their games. Other USL teams get at least 6,000 with Cincinnati getting 20,000 people on average per game,” Fleming said. Jacob McCleland: Molly, Sooner Investment Realty is looking at the vacant Producers Cooperative Oil Mill. They tend to focus on retail development, this investment group does. Is that what we're looking at here for this 37 acre site? Molly Fleming: Sooner Investment doesn't have any specific plans. The first task is to work with the city and see really what works best for the land. You know like you said Sooner Investment is known for retail development. They did the Academy Sports and Hobby Lobby there in Midwest City. But Sooner Investment partner Bob Stears is working with consultants on figuring out what is best for that site. So yes there could be some retail but there could also be multi-family and office buildings. A site plan is expected to be revealed in May. Stearns said very sternly though that he doesn't want to make another Bricktown. He doesn't want to do another you know central business district. He wants to do something special at this site. McCleland: Well this site does seem to be in a pretty ideal location. I mean it's right there at the intersection of two interstates. It's right by the river and by Bricktown and the new park is going to be going in nearby. Fleming: Yeah. Broker Don Hayes he's called this site a jewel and rightfully so. Other mid-sized cities downtowns are fully developed. So this this is a pretty big opportunity. It's the last remaining piece. So there's a lot that could be done here. I mean how how often do you get to shape the skyline into a mid-sized city? McCleland: Now the Producers Cooperative still owns this site. Are they looking to it to sell it or to lease it? Fleming: It is for sale. Don, that's what Don Hayes said today he's got it listed for $65 million. Once again it's a 37 acres. But there could be ground leases, meaning that somebody could lease the land but not actually buy it. McCleland: Now the Producers Coop filed an application to demolish the buildings there and environmental assessments have already been conducted. I mean this is obviously it's an it's an old industrial site. Will there be any need for any environmental remediation? Fleming: According to producers car president Austin Rose, the site doesn't have any major environmental issues. I did read something about another developer's look at the site and his his thoughts were a little different but Austin said in a statement to us the other day that there wasn't anything really dramatic about the environmental problems there. McCleland: Now this isn't the first time that we've heard about plans for this location because not that long ago Bob Funk Jr. and a group of investors was considering this spot for a Major League Soccer stadium. What happened there? Fleming: Bob was really hane has had on this development being a private-public partnership. We've seen that happen in other cities. Kansas City, for example, that was a private-public partnership to build their soccer stadium. And in Oklahoma City, Bob's plan for a private public didn't come to fruition. The city isn't going forward with more MAPS work in the bond project list, which people will vote on in September. And that did not include you know money for the soccer stadium. McCleland: So is this the end of the story for Major League for Major League Soccer stadium in Oklahoma City or are there other options? Fleming: I think Bob's number one goal right now is to get a soccer specific stadium built. The United Soccer League the USL, that's where the Energy. That's the league in which the Energy plays. They want all their teams to be in a soccer specific stadium by 2020. Taft Stadium is three yards short of the United States Soccer Federation standards. And I know that Bob has been in talk with the Wheeler district to get in that area you know on the south side of the river which would put it close to south Oklahoma City. McCleland: So the Oklahoma City Energy is now range just one division lower than Major League Soccer. MLS is planning to expand to four more cities. But Bob Funk didn't apply for the energy to be in this round of expansion. What's his plan to bring MLS to Oklahoma City at this point? Fleming: But as a 9 year timeline to get an MLS team. He has said before that he thinks the MLS will add more teams by the time he wants to apply. But MLS has several things it looks for including two key items which are attendance and a good television market. The energy brings about 4400 people to their games. Other USL teams get at least six thousand with Cincinnati getting 20000 people on average per game. McCleland: We've been talking today about development in downtown Oklahoma City and of course soccer with Molly Fleming. She's a reporter with The Journal Record newspaper. Molly thank you so much it's been a pleasure talking with you. Fleming: It's been great to do with you.